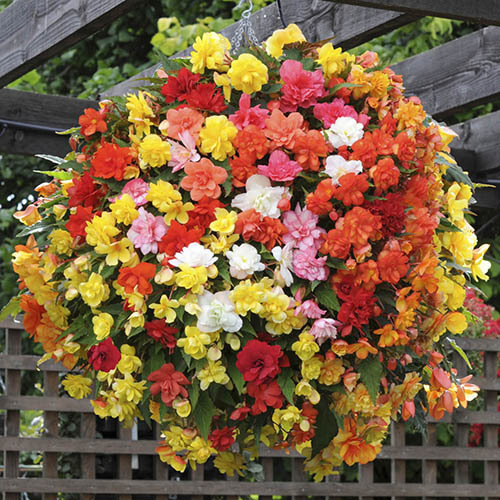 Will provide you with the most torrential summer-long display of semi-double cascading double begonia blooms - each 3-4in across! Illuminate your summer displays with the very latest and best trailing Begonia - Super Cascade Mixed… Containing THE very best palette of bright colours ever seen in begonias, including some completely new shades, Super Cascade will provide you with the most torrential summer-long display of semi-double cascading double begonia blooms - each 3-4in across! Super Cascade is ideally suited for the British climate too with strong, very weather resistant blooms - giving you a cascading rainbow of colour from May until early November. Grow in hanging baskets, window boxes and patio containers - anywhere that will allow the plants to cascade freely, then just wait for the flowers - whatever the weather! Trails to 60 cm (24in).